Leonard Prince, 24 years old, comes from a life of struggle. 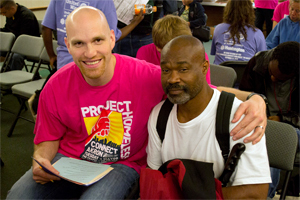 Jobless, and with parents who both work 3 jobs each, he found Project Homeless Connect (PHC) to be a helpful connection to much needed resources. "Akron's a good place," Prince said, who recently moved here from Cleveland in hopes to start his own business. Help for this man, along with many others, wouldn't have been possible if it weren't for the 600 plus volunteers and agencies that gathered to put their hands to a good cause for the homeless. "People donated everything from socks, to underwear, to going to Gabriel Brothers and buying what they could," Sean Freeman, President of Cole Industries, who runs the clothing area of PHC, said. Freeman first discovered his passion for helping the homeless several years ago while participating in the Point in Time Count – a day in January where every big city goes out and counts their homeless population. "Our job was to count the unsheltered homeless that were living outside in the middle of the winter. That was eye opening for me. Someone in a tent, in the middle of Akron, in the middle of winter is eye opening for anybody," Freeman said of his experience. This is what motivated him to now lead monthly hikes to different homeless camps all around Summit County. As for PHC, he says "This may be the first time (a volunteer's) ever had the chance to talk to a homeless person and not just see them on the side of the road with a sign." Melissa Massey-Flinn, Program Director at H.M. Life Opportunity Services, is also dedicated to this event. 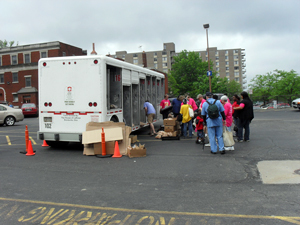 "The staff at H.M. Life Opportunity Services has been here for every one of the PHC's. 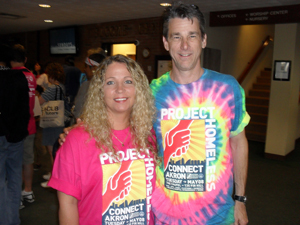 We're a transitional housing program here in Akron and have been providing housing and services to homeless families for the last 25 years," Massey-Flinn said. "The goal of our program is to help the family become self-sufficient and ultimately return to permanent housing that they're able to maintain," she continued. Having agencies such as this show up opens a whole new door of opportunity to the homeless, literally, that they may not have ever walked through. "It's just a really nice opportunity to get the whole staff out and be a part of this great event. We serve so many people here every year and it's something that my staff looks forward to," Massey-Flinn said, "It's an opportunity to find a network of some of our cohorts in the community and other service providers and it's also a really neat experience." Many guests found comfort in the prayer room with Pastor of Care Steve Bucy, and Vicki Caswell, Editor on the Communications team at the Chapel. "I asked the first woman who came in 'How can I pray for you?' and immediately the tears just started. Her mom was just diagnosed with cancer, her husband had an affair and left her, she has 2 small children at home, lost her father last year…. "Caswell shared. "It was like 'wow'. All of these boom, boom, boom things. The crises that were erupting in her life. I gave her a big hug and told her 'I'll keep praying for you'," Caswell said. Situations and prayer needs varied from financial issues, to grief issues and dealing with the loss of loved ones, to health problems and employment. "One of the men that came in was struggling with drug addiction which created a lot of issues in his life. He'd been in and out of the penitentiary and wanted someone to pray that he would be able to beat the addiction that he had," Bucy said. Bucy knows the importance of prayer first-hand. Three years ago he was diagnosed with pancreatic cancer and was healed. "Instead of being a patient, which I was for about 2 years, now I'm back in the ministry full time. Prayer means a lot to me in my life. I've relied on prayer for many years of my life. We take prayer seriously," Bucy shared. As for PHC, Caswell says "I know the staff (at the Chapel) looks forward to this. We have a lot of volunteers from the congregation and people are just blessed by the people they come in contact with." The beauty of this day is showing love and compassion to everyone in need, and not turning anyone away, but showing them that they are loved regardless of the decisions they have made or what has happened to them in life. "I've dealt with all types of people - alcoholics, drug addicts, abused, homeless…" Vicky Shockey, a volunteer who was once homeless, said. "I'm here for the people, to show them the love that I have to give to them, to let them know that people do care," Shockey said. "There's a lot of people that do care, no matter who you are, what you are, what you come from…This project is because we care. We want people to know, because a lot of people feel that they're not special, not important, or no one cares about them. I used to feel like that, but don't feel that way anymore," Shockey explained.